Summers in Austin can be comically hot. Actually, the springs can, too. And the fall. Basically, there's a pretty wide swath of the year here when a refreshing frozen treat does wonders for your body temperature and general sanity, and no frozen treat packs the dual threat of nostalgia and deliciousness quite like the snow cone. Here are eight Austin stands that have your back when that craving hits. At the corner of 45th and Burnet, this humble snow cone stand waits to serve your every shaved ice whim. Need some cookie toppings to assist that Guava flavor? Done. Feeling Sour Patch Kids? You got it. Chocolate? Definitely. Pickles? But of course! If indecision is insurmountable, spring for a house special instead. There’s the Apple Pie à la Mode, the Dirty Blonde, the Hippy Hollow, and more. 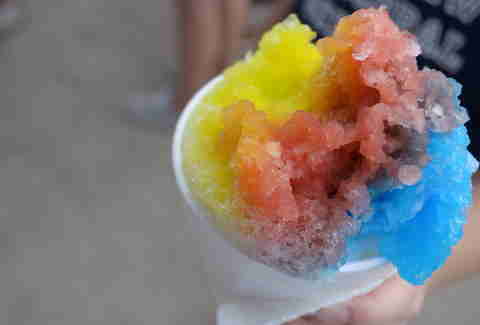 Sno-Beach is the Franklin BBQ of snow cones; the SXSW of shaved ice. So yeah, be prepared to wait in long, languid lines on hot days when the Austin original food trailers are especially popular. Both locations have all the flavors typical of a traditional snow cone stand plus cream, caramel, or ice cream toppings, but you can’t go wrong with a classic rainbow setup. 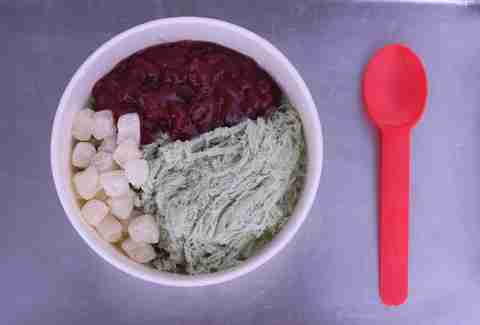 This out-of-the-way North Lamar spot offers monstrous bowls of shaved "snow ice" in honeydew, sour plum, taro, matcha, and lychee flavors. Add frozen fresh fruit, boba, jelly, aloe vera, or panna cotta; eat, and then repeat the cycle when you get to craving it next week. Go to Casey’s New Orleans Snowballs stand for the homemade, pure cane sugar syrup, but stay for the Boston Cream Pie cone. Crafted with pie-flavored custard syrup, Casey’s in-house chocolate sauce, and cream topping, this snow cone is in a class of its own -- unless of course, you consider the strawberry cheesecake, pumpkin pie, and chocolate covered cherry options. 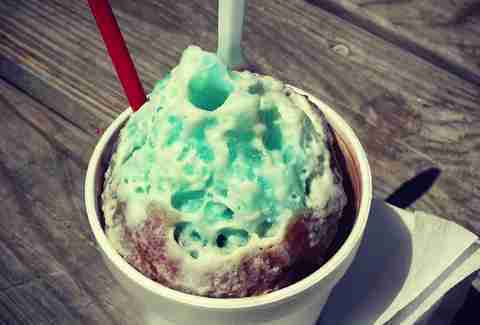 What goes better with a snow cone than... roasted corn? That inconsistency notwithstanding, Top G’s is one of the few snow cone stands in Austin to offer a full flavor smorgasbord of piccadilly shaved ice. If you’re scratching your poor, little, unsuspecting head, a piccadilly has all the sweetness of a snow cone, plus the added sour power of chopped pickles. Add chamoy on top and, uh, don’t forget the corn. 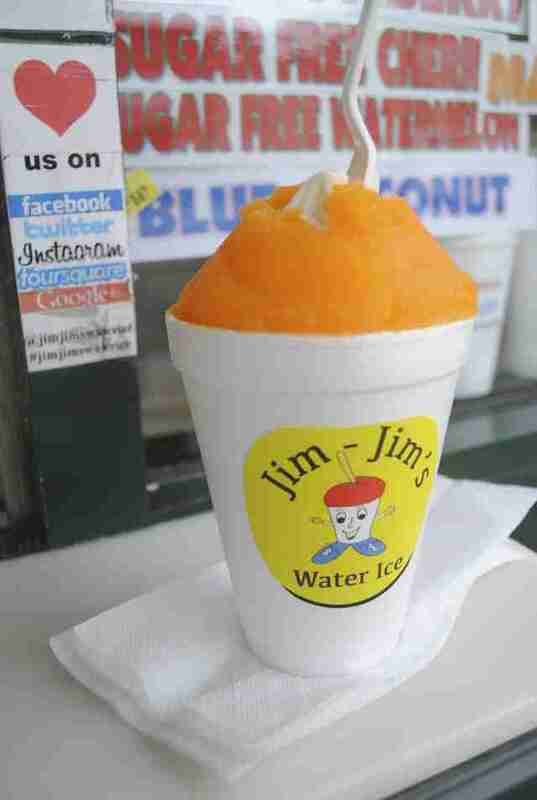 For those brave enough to face Sixth Street by the light of day, Jim-Jim’s Water Ice is there to embrace you in its cold, icy arms. The Italian ice stand is an Austin institution with the usual offerings -- strawberry, piña colada, watermelon, etc -- as well as a gelatti innovation that combines ice cream with flavors like orange cream for dreamy sipping. Ok, so SnoLabs’ frozen goods aren’t really snow cones, and they’re not really ice cream either. Instead, they’re what you’d get if both vanguards of frozen food had the reproductive organs necessary to make a lovechild. 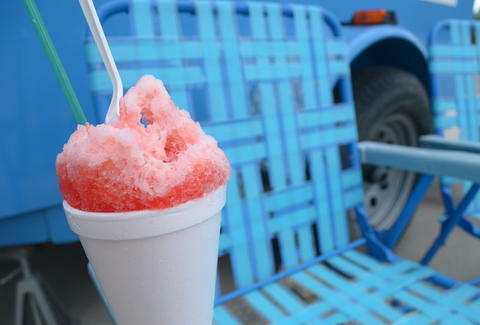 The South First food truck creates vegan coconut SNÖ using coconut milk, then shaves it down as if it were ice to create frozen flakes in green tea, blueberry, and strawberry flavors. If you’re tired of Tiger’s Blood -- and really what is Tiger’s Blood anyway?-- Sno Springs off Barton Springs offers alternatives to the typical snow cone fare. Check out the red velvet, Champagne, cherimoya, and tiramisu flavors, and be grateful you’re not the operator behind the old-fashioned, hand-cranked ice machine.